Predict the metabolic stability (half-life and clearance) of your test compound or xenobiotic using our Metabolic Stability assay. In the human body, the liver plays a major role in the metabolism and clearance of drugs absorbed through the gut. Therefore, in vitro metabolic stability is an important early ADME test for predicting in vivo half-life and clearance of a test compound. Our Metabolic Stability Assay uses microsomes (various species available) and human primary hepatocytes in a sandwich culture. While microsomes contain Phase I enzymes, primary human hepatocytes in sandwich culture contain both the Phase I and the Phase II enzymes. The microsomes and/or primary human hepatocytes in sandwich culture are exposed to the test compound for a number of exposure times and the samples are then assessed by LC-MS/MS to determine intrinsic clearance of a compound. 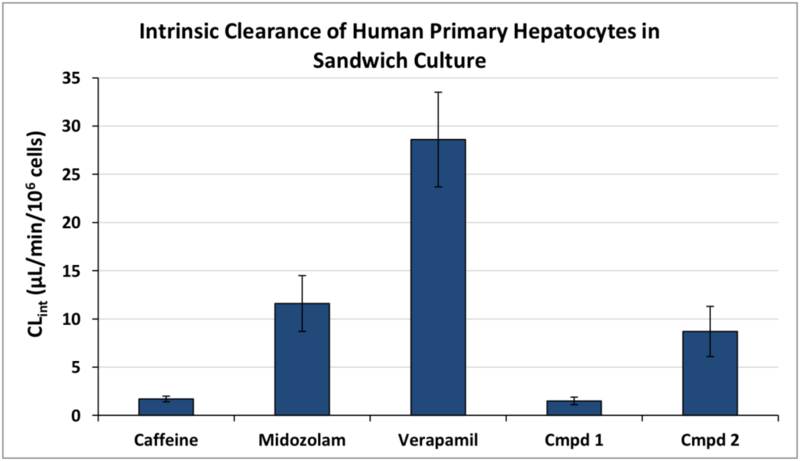 The graph illustrates the Intrinsic Clearance (CLint) of low (caffeine), medium (midazolam) and high (verapamil) clearance controls, as well as two blinded compounds, in human primary hepatocyte sandwich cultures. IONTOX's Metabolic Stability assay can be combined with the Human Dynamic Multiple Organ Plate to assess how one organ impacts the pharmacokinetics and pharmacodynamics of the test drug or chemical. Lung-to-liver, or Intestine-to liver models can provide important information on how the test compound will behave in vivo.